HOME GROWN RASPBERRIES YUM YUM! 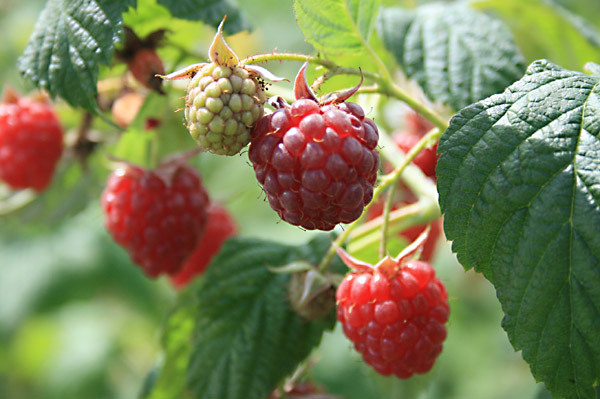 So here’s today’s free PDF download on How to Grow a Good Crop of Raspberries, with my best wishes. If you have any problems with the download drop me an email to ruralgardeners@gmail.com and we will do all we can to to help. Anyway, on to the main event! Late summer fruiting Raspberries, what a treat! I don’t know about you, but I never get tired of fresh picked home grown Raspberries. The flavour of these freshly picked little gems always seems to be so much better than the supermarket varieties. I’ve never confessed to being a great gardener, but I do like to have a go, especially when it comes to growing fruit and veg. I don’t use any special techniques, all I do is try different methods, and then wait to see which one produces the best results. Take my Raspberries as a case in point. When I looked a bit closer and lifted a few of the branches the canes were loaded with fruit, which was fantastic news as we don’t have any other fruit ready for picking anywhere else in the garden. The strawberries are all finished and I don’t have any current bushes or gooseberries for that matter. The orchard fruits have a few weeks to go before they are ready, apart from the Plums which should be ready sooner, so it’s fantastic that we have some juicy berries for the table. Of course I had to taste a few, just to make sure they were suitable for the table :). The variety is ‘Leo’ which is actually a late summer fruiting variety with a gorgeous flavour and the fruits are firm and fleshy. I’d never grown raspberries until a couple of years ago when I thought I’d give them a go. As I had no real experience I didn’t give them any special treatment, but they only produced a few fruits. Then I read that Raspberries don’t really tolerate chalk as they prefer a slightly acidic soil, which considering my garden is sitting on a layer of chalk, was probably responsible for the poor crop. Then, last Spring (April) I had to move my canes as I needed the ground for another project. This time I thought I’d give them a bit more care as I wanted to prove to the family that I could grow fruit on our chalk soil. I’d read somewhere that Raspberry canes thrive on damp conditions, so I thought I’d give them the same preparation as my runner beans, as they also thrive on moist conditions. The plants were healed in nice and deep as the roots need to be well below the surface to stop them drying out, then a month later I top dressed the plants with a 4″ layer of general garden compost. I’m pleased to say the plants have repaid all that effort with healthy looking bushes and best of all, loads of succulent, tasty fat fruits. I don’t protect my raspberries from the birds as there’s enough to go round, but if you see any sign of significant bird damage, then I’d have no hesitation in netting my fruit. I’m going to prune the late fruiting bushes hard back when they have finished, and give them a sprinkling of bone meal around the base of the plant, by way of a thank you for providing us with so many treats this summer. We also have an early summer fruiting variety, ‘Glen Moy’ which fruits on the previous years growth, so I’ll remove any 2 year old wood from the patch and tie the remaining new canes on to the wires, ready for next year. If you plan to plant your own canes, then ideally you should plant them this autumn, so they have a chance to get established before they burst into growth next Spring, and if you’re on chalk, or any soil for that matter, take the time to prepare the soil as I did, and you will be eating raspberries throughout the summer. Next year I’m going to add a couple of redcurrant bushes and maybe a couple of Gooseberry bushes so we have a bit more variety. If you have space for a few canes then give them a go, not only will they produce gorgeous fruit, but they also make for a vibrant green summer screen.